Falvey Memorial Library :: Throwback Thursday: Where is the Sister Bell? Throwback Thursday: Where is the Sister Bell? 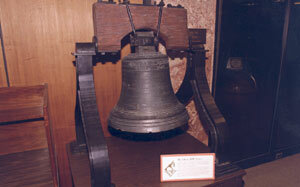 The “sister” of the Liberty Bell, formerly housed in the library. Where is the bell now? The Sister Bell was moved to the Augustinian Heritage Room. She may be seen by appointment by calling Father Marty Smith: 610-864-1590. Father Smith notes that people come from all over the country to view the bell. Maybe you will too! More information can be found on the Blue Electrode blog.